Approximately half of St. John is a U.S. National Park. Within its boundaries you will find a number of magnificent beaches, many hiking trails through the island's forests, and sight-seeing opportunities everywhere. Plus there are many interesting places to shop, both on St. John (and on St. Thomas). 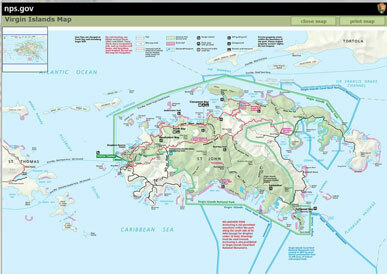 Click on the picture of the map to link directly to the National Park Service map of St. John. If you have Adobe PDF Reader software installed on your computer, this map will display, and you will be able to zoom in to see the locations of the beaches, trails, villages, and roads mentioned below. However, once you get to St. John, make one of your first stops the gift shop at the National Park's Headquarters located in Cruz Bay. There you can pick up a free paper copy of this same map to keep with you throughout your stay on St. John. It will come in handy many times. Click picture to link to a map of St John. Trunk Bay Beach: The most popular beach on the island and considered by many (including National Geographic) to be one of the most beautiful public beaches in the world. For beginning and intermediate snorkelers a nice attraction is the underwater self-guided snorkel trail. Just off the beach, you will also find showers, changing areas, telephones, a picnic pavilion, restrooms, a snack bar, a watersports shop (with snorkeling equipment and beach chair rental), and a gift shop. 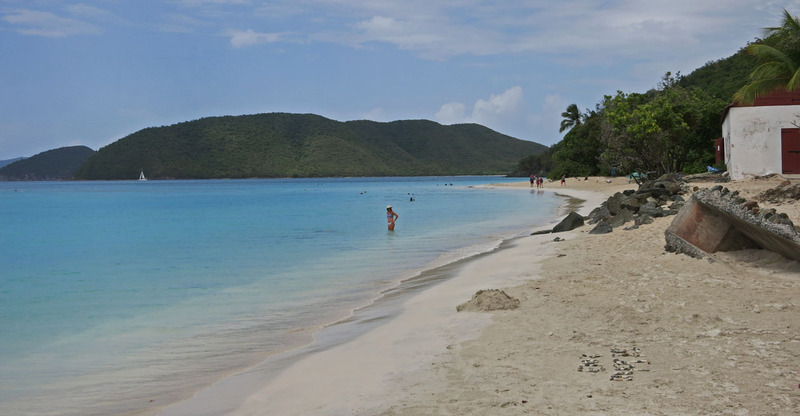 Cinnamon Bay Beach: Also a beautiful beach and the largest one on St. John. 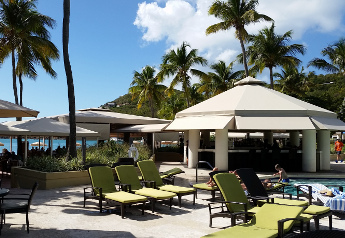 For those who enjoy windsurfing, Cinnamon Bay is their favorite. 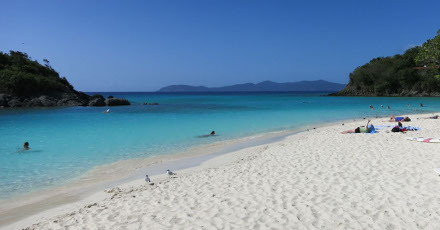 The wind at Cinnamon Bay is usually steady and somewhat brisk, perfect for windsurfing. Within the park you may rent windsurfing equipment of any type, from beginner to expert. There is also a small grocery store for campers and the Tree Lizard restaurant (which always serves good dinners regardless of whether or not you are headed for the beach itself). In addition to renting windsurfing equipment, you may rent snorkeling gear, sea kayaks, and windsurfing boards. This beach also has showers and restrooms. Cinnamon Bay Beach: St. John. Francis Bay Beach: This beach is far enough toward the east end of the island that you will probably elect to use a rental car to get there rather than a taxi. Francis is the beach to visit if you want to see lots of wildlife. But don't plan on staying much past 2 P.M. because at about that time the "no-see-ums" begin to annoy those on the beach. 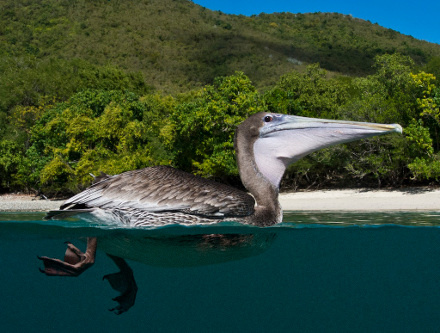 Brown Pelican seen by snorkeler. Reef Bay Trail: Weekly, the NPS provides a guided nature hike that descends from the trailhead at Centerline Road to Reef Bay (actually Genti Bay) Beach. Here you will pass through some of the most densely forested parts of St. John. At the beach, hikers board a boat that returns them to Cruz Bay village -- without having to climb back up the 800 foot elevation. The sugar factory ruins at the foot of the trail are particularly interesting. Easy hike, steep in places but all downhill, no more than two hours long. 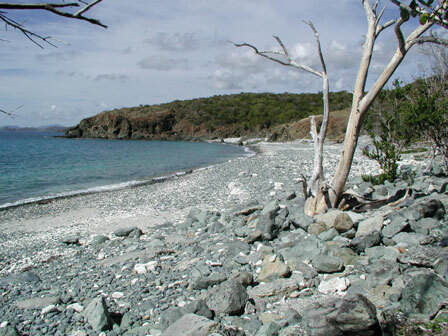 Ram Head Point Trail: You start at the parking lot for the National Park's Salt Pond Beach area, at the east end of St. John. 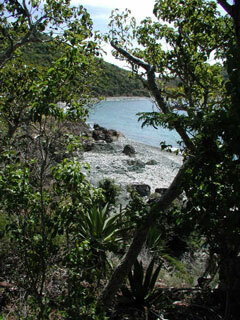 You then descend to Salt Pond Beach which has crystal-clear waters but little or no shade. Before proceeding further, you may elect to take the short spur trail to Drunk Bay where you will see some interesting (but man-made) coral formations. 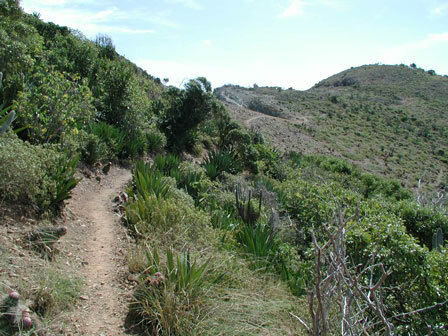 This spur trail skirts the perimeter of the salt pond after which the beach is named. After returning to the beach, you continue to walk around the Bay (with the water to your right) looking for markers left by previous hikers that tell you where to leave the Bay via a steep but short trail that takes you to the next bay immediately to the east. Again, you keep the water to your right and walk clockwise around this second bay, looking for another marker at the head of the second and last trail leg. 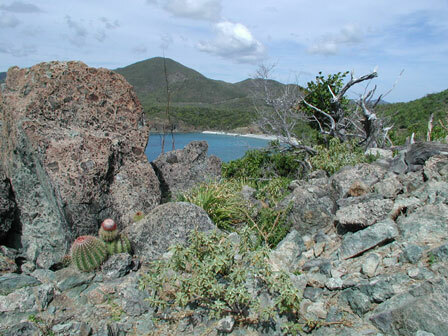 From here it is a slow ascent of 200 feet to the peak of Ram Head Point, the southernmost point on St. John. There are great views along the way and a couple of places where the winds blow refreshingly briskly from the east. Once you reach the top of Ram Head Point, the 270° panoramic view is extraordinary. Bring your camera. Easy hike, about 1 1/2 hours long. Views along the Ram Head trail. Margaret Hill Trail: This is a steady hike upwards through forest for the entire distance until you reach the top. 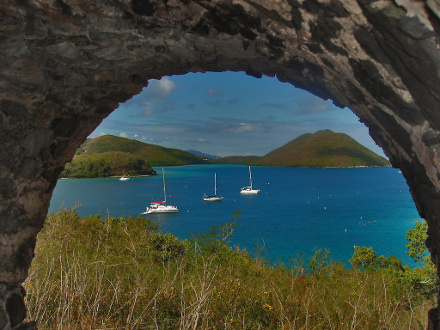 From here you can look to the West, South, and Southeast and enjoy nice views of St. Thomas, some of the larger cays in the US Virgin Islands, and a few of the British Virgin Islands. A moderate hike, about one hour. Johnny Horn Trail: Begin at the parking lot at the Annaberg ruins and walk east along the north shore for about 1 mile. This particular hike ends at Waterlemon Beach. As you look toward your left, out into the Bay, you'll see Waterlemon Cay. If you have brought your snorkeling equipment, take the time to swim out toward the Cay; some of the best snorkeling on St. John is here. At the far end of the beach it should not be hard to find the Johnny Horn Trail itself. It ascends and descends a couple of times before beginning the final, tough hike over the "backbone" of St. John. As you descend down the other side you will pass by the venerable Moravian church building and then find yourself in the village of Coral Bay. This would be a good time to visit the "Skinny Legs" open-air restaurant and rehydrate. It will also be a good time to congratulate yourself that you arranged for someone to bring the car around to Coral Bay and pick you up, rather than hiking all the way back over to the north side of the island. 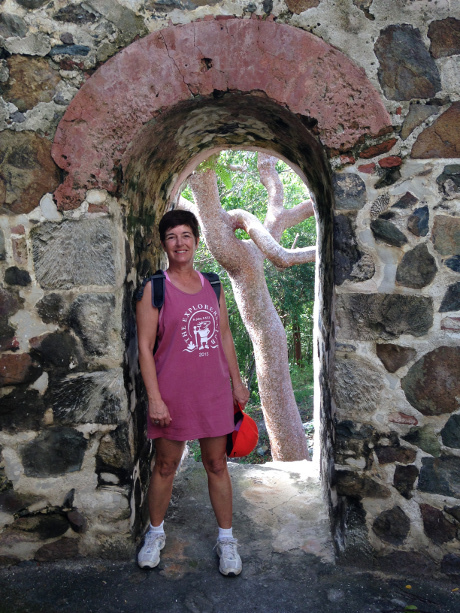 A vigorous hike that takes a little less than two hours, especially if you stop and visit the ruins of a Danish mansion that afford a magnificent view -- across the Sir Francis Drake Channel -- of Tortola and at least three other of the British Virgin Islands. Ruins & view along Johnny Horn Trail. Hiker at Danish mill ruins on John Head Road. Though Cruz Bay village is tiny, there are many nice places to shop, especially within the Mongoose Junction complex at the north end of town, the Wharfside Village shops just south of the ferry dock, and the Marketplace shopping center, which you will pass as you leave Cruz Bay to return to the Westin Resort. Also, the city of Charlotte Amalie on St. Thomas is only a 45-minute ferry boat ride away. There on the waterfront you will find dozens of stores offering duty-free jewelry, cameras, optical equipment, and liquor. There are also many specialty shops selling clothing, toys, maps, etc. Then, it's easy to grab a taxi to take you to the Havensight shopping center right next to where the gigantic cruise ships dock. (St. Thomas has the deepest port in the Caribbean.) Each of the large, air-conditioned buildings that make up this shopping center contains dozens of additional shops with many unusual items. Brown Pelican and Johnny Horn Trail photos provided courtesy of Mr. William Doebler.